New Close Farm Barn is a detached family home with oak weather boarding to the elevations and a pitched tiled roof. Features of note include exposed timbers, under floor heating throughout the ground floor, electric Velux windows to the first floor and stylish Plantation shutters to most rooms. The open plan sitting/dining room boasts an impressive brick fireplace fitted with a double sided, multi fuel burning stove, and glazed doors providing access to the garden. The study has bespoke oak fitted bookshelves and desk unit, as well as extra sockets and telephone/satellite points to facilitate home working. The kitchen/breakfast room has a range of fitted bespoke wooden units, granite worktops, a central island, Rangemaster oven, wine chiller and integrated appliances. Further cupboards, a Belfast sink and plumbing are located in the spacious utility room. From the glazed inner hall, a turned staircase leads to the first floor with galleried landing. The dual aspect master bedroom has built-in wardrobes, vintage-style radiator and a contemporary-style en suite shower room. The guest bedroom also has built-in wardrobes and an en suite shower room. There are 3 further bedrooms, one with a low level glass wall which provides stunning views of the grounds, and a modern family bathroom. The property is situated at the end of a private lane, within close proximity to the Surrey Hills Area of Outstanding Natural Beauty. Dorking is about 4 miles distant and is renowned for its boutique shops and restaurants. Additionally, there are numerous recreational facilities in the area, notably golf at Betchworth Park and Dorking golf club, and picturesque walks within the Surrey Hills. There are also good transport links with both Holmwood and Dorking stations providing regular access to London, and the A24 providing access to the M25. Schools in and around the area include The Ashcombe School, Hurtwood House, Farlington, the Duke of Kent School, Christ’s Hospital and Cranleigh. 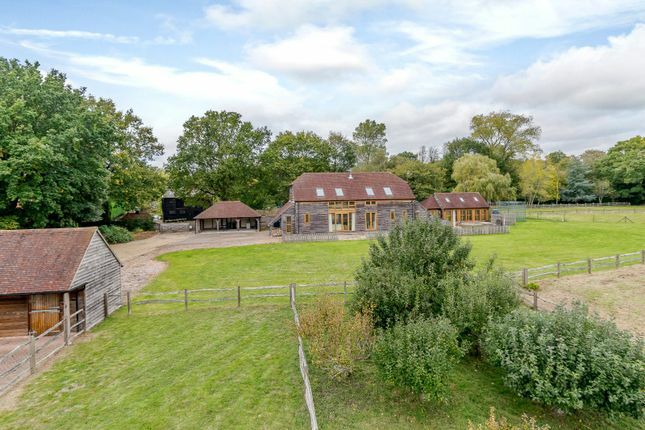 The property is accessed via a shared private drive, with electric 5-bar wooden gates leading to a gravel drive, which provides access to the car barn and stable yard. The detached studio/annexe could be put to a number of uses, and is of similar construction to the main house. It has under floor heating, and benefits from a separate shower room. Triple doors open onto an attractive Indian sand stone terrace which stretches across the side of both properties, and includes a timber decked area making this a perfect spot for enjoying views across the gardens and grounds. There is also a small orchard; and beyond the paddocks lies the private woodland with areas of bluebells and other wild flowers. The stable yard has 4 loose boxes, one of which has been boarded to facilitate use as a tack room, and an open store. The sand school is to the west of the stable yard between the two paddocks which are mostly post and rail fencing. 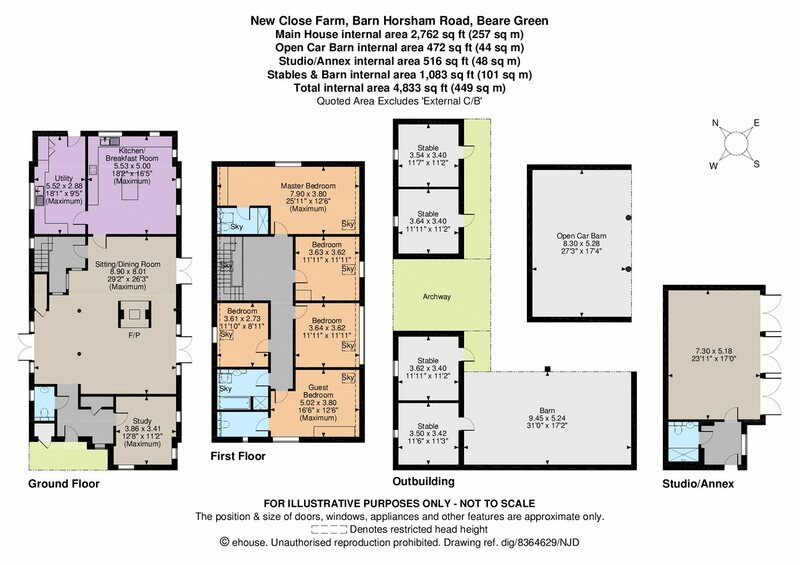 Property descriptions and related information displayed on this page, with the exclusion of Running Costs data, are marketing materials provided by Strutt & Parker - Horsham, and do not constitute property particulars. Please contact Strutt & Parker - Horsham for full details and further information. The Running Costs data displayed on this page are provided by PrimeLocation to give an indication of potential running costs based on various data sources. PrimeLocation does not warrant or accept any responsibility for the accuracy or completeness of the property descriptions, related information or Running Costs data provided here.